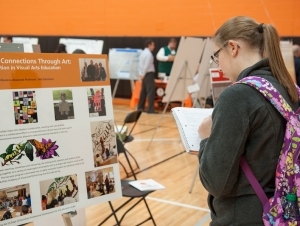 The 16th annual Faculty and Staff Research and Creativity Fall Forum will be held Thursday, October 29, from 11:00 a.m. to 1:30 p.m. in the Houston Gym. During the two-and-a-half hour forum, diverse examples of research—from incorporating play into the teaching of children with autism to Buffalo’s 2014 “Snovember”—will be on view. Approximately 85 stations, composed of posters, handouts, and one-on-one discussions, will be included. The Research and Creativity Council and the Academic Affairs Office in conjunction with Research and Economic Development and Sponsored Programs Operations, support the forum. As in past years, the goal is to develop, encourage, and support faculty and staff research and creativity and to make collaborative research endeavors and grants more accessible. For members of the Buffalo State community, it also provides a convenient and fun way to get a glimpse of the varied research taking place across campus. Provost Perreault will offer welcoming remarks at 12:30 p.m. Light refreshments will be provided for all participants and attendees. The event is open to the campus community. All students are welcome and encouraged to attend. Preview the presentations and find presenter locations.